Karl Mielenhausen, Commodore, called the meeting to order at 5:15 PM, following a social hour. Membership – Membership has weakened over the past year, currently standing at 366 families. This represents approximately 31% of the C320 hulls sold to date. This is a decrease from a peak of 411 in February 2009. In response to a question, it is believed that the C320 currently is being produced only upon order but has not gone out of production, contrary to rumor. Financials – Financial statements were not produced but it was reported that the checking account balance as of June 30, 2010 was $7,470. An additional $11,900 is in a CD investment that continues to rollover annually. The Association is cash flow neutral at this time, mainly due to the lack of a Rendezvous the past few years. 1. The C320 received a very positive review in the May 2009 issue of Soundings. 2. The Toolbox Loaner program was added. 3. There have been significant website upgrades and layout improvements. 4. Logo’d apparel has been made available through Lands End. 5. Written procedures have been developed for many of the ongoing Association tasks and duties. 2. Increase the role of the C320 owners in their Association. 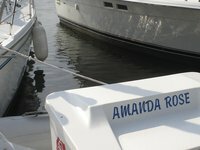 Despite intensive planning for a C320 Rendezvous in Marina del Rey in 2009 by Mr. Orlando Duran and his committee, only five members signed up to attend thus, the Rendezvous was canceled. Discussion followed among all participants as to ideas for maintaining the Rendezvous tradition. All were in agreement that this is a significant value-add to Association membership. Following all discussion, it was determined that we should hold the Rendezvous, Regatta, and Annual Meeting in conjunction with the All-Catalina Rendezvous’ held annually on both the East and West Coasts. The website, another significant value-add of Association membership, continues to be enhanced through improvements. Long term, the Association needs to investigate the feasibility of outsourcing the website development in order to “take it to a higher level” of user-friendliness. Mr. Allan Field, custodian of the program, reported that usage has been minimal. He also reported that he has arbitrarily removed the Laser Tachometer from the program (unless delivered locally either by pick-up or drop-off) due to the cost of shipping and handling exceeding the cost of the tool. It was also determined that the position of Chief Measurer was no longer required. Pat Reynolds was recognized in appreciation for his many years of service as Secretary/Treasurer of the Association. Tax Filing Status – There was a brief discussion regarding the Association’s tax filing status and where the Association is chartered/incorporated. Mr. Field agreed to follow-up on this. Association Funds – There was discussion as to whether or not the Association required almost $20,000 in retained earnings and whether or not this could be put to uses that promote the Association’s mission and vision. Ideas put forth included developing a scholarship program for students in collegiate sailing programs, sending young person’s to summer sailing camps, and donating to the U.S. Sailing Hall of Fame. Mr. Field agreed to try and develop some of these concepts over the next year, once the tax filing status has been determined. There being no further business, the meeting was adjourned at 6:15 PM.